New Moon is a forerunner of imaginary, engaging and creative film-making; both fictional films and documentaries. The company specialises particularly in the areas of sport and education. Responsible for making the films which helped to win the London bid for the 2012 Summer Olympics, New Moon position themselves as a company that has been pushing boundaries for the past decade. A dynamic website was essential, but practicality was also crucial. An important part of OMdeSIGN’s project was to create a website that would be more usable, with backend functionality that would save the company time on a regular basis. A CMS was put in place, making the site easier for New Moon to maintain, allowing for the updating of text or images, as well as the potential to create new user accounts. In addition to this in-house functionality, the website needed to be easy and intuitive for their customers to use, enabling seamless navigation to make using their new website a pleasant experience for all. The website offers excellent exposure to New Moon’s completed film projects, providing a comprehensive showcase of the company’s work. This was designed to help ensure that potential new customers viewing the site would be instantly engaged with the expertise of the company. 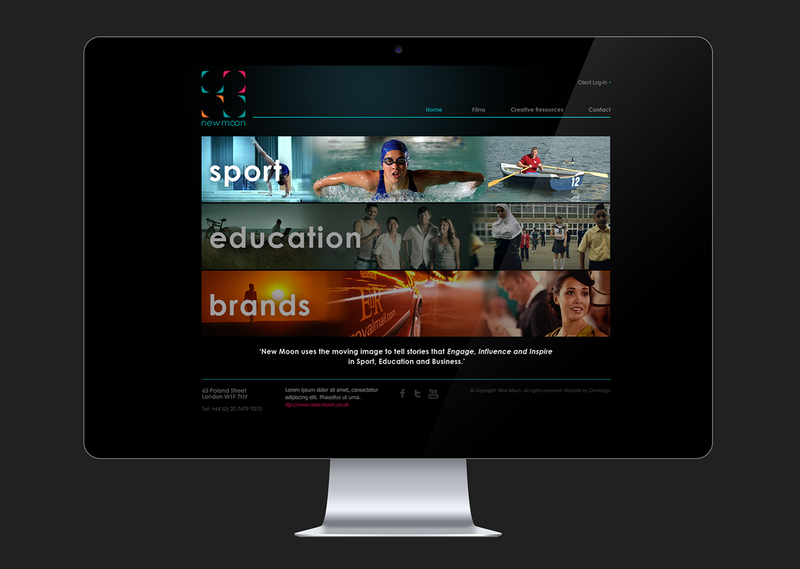 OMdeSIGN ensured that the new website would be clear and bold. The site is designed to draw users in with a friendly and intuitive style, as well as making it easy for them to seek additional information about the aspects of New Moon’s work that most interests them. A specially designed Client Portal allows anyone working with New Moon to keep track of their project as it progresses. Using the password protected interface, the user can access the information that is relevant to them in a secure way. The Client Portal can store unlimited amount of projects, and an unlimited amount of films, each of which could be shared among different users, allowing for improved space management on the server.